I love fusion food. Its probably my interfering Indian genes, but I love playing with food, and I absolutely love it when I make a dish that started off as an idea and ends up as a beautifully harmonious blend of many different cultures. I got the opportunity to make one of my favourite fusion recipes when I was contacted by Arla Foods (who make Tre Stelle and Apetina Feta cheeses) and offered the opportunity to review some of their cheeses. Almost immediately I knew I was going to make pizza, I mean... cheese? Pizza of course. I don't know why I've never blogged this recipe before, to be honest. I make this particular one all the time, but at the same time, now that I think about it, it also disappears pretty quickly. At least, quicker than I can get my camera out. 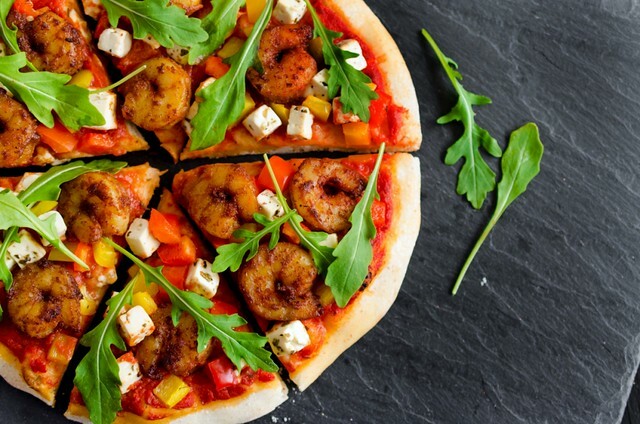 My usual toppings for this pizza are tandoori prawns, peppers, cilantro and mozzarella. This time round, I thought I would be a little different, and decided to go with feta cheese. I've been eating a fair bit of feta in recent times, and I also really like the convenience of Apetina Feta Cubes, so the choice was pretty easy to go with. So I made this recipe, and while I loved the combination of spicy tomato sauce, fresh red peppers, spicy-sweet tandoori prawns and salty, creamy feta cheese, I felt like it was lacking something. Kay then suggested that I should add something green, and of course, that was exactly the missing link I was looking for. I went with arugula, or rocket, as I call it, and it completed the pizza almost like magic. The subtly delicate pepperiness of fresh baby arugula was the perfect foil for the balance of flavours in the pizza. I was hugely chuffed with how this pizza turned out. But of course, as is usual, it took me forever to get the pictures for this post. When I first made it, I waited too long into the evening, and I lost my natural light. The second night I made it, same thing... plus, I managed to get almost everything else wrong and ended up with one burnt slightly charred pizza (was still delicious, though) Finally, as I was thinking that I was never going to get the damn pictures for this pizza, I got one afternoon, and everything worked out (whew!) and the result are these pictures. They're not my best ones, but again, everyone knows how hard it is to make pizza look great in pictures. As Aditi says, pizza is for eating mum, not making it look pretty and cute :) Kid's got it right this time... this pizza is one of the best ones I've eaten. 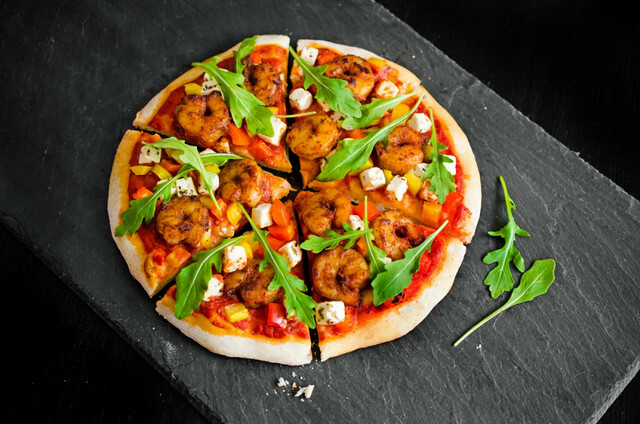 The hardest thing about this pizza is trying not to nick all the tandoori prawns before they get on to the pizza. I absolutely love tandoori prawns, and of course, they are a great appetizer just by themselves. In fact, one of the other things I do with these prawns is make a kebab with fresh, sweet peppers and feta chunks, all skewered together and quickly charred on a barbeque and served with a squidge of lemon juice. Droolworthy, indeed! This recipe probably looks long and complicated, but in reality, its just made up of a few very easy components and almost all of them can be made ahead in advance, and the pizza itself is just an assembly job. I love making the prawns using my own blend of tandoori masala, but you can just as easily use a shop bought mix. Just make sure you adjust the salt level, as my homemade blend has no salt in it, and most store bought mixes will have salt. The spicy tomato sauce balances the natural sweetness of prawns and you can easily adjust the spice level to match your own, by reducing the amount of chilli flakes. I used Apetina Feta Cubes for this recipe, and I love the creamy, saltiness of this cheese. 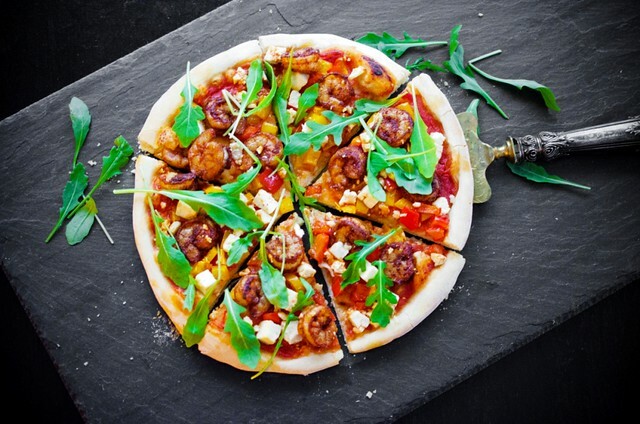 You can just as easily use one of Apetina's flavoured fetas like their one with garlic and herbs, which I personally think would be brilliant with the flavours of this pizza. You can also go lighter with their light cubes or blocks. This pizza also works really well on the barbeque. All you have to do is turn up the barbeque to 450 F, then slide the flattened pizza bases, without the toppings, directly on to the grill. Quickly grill on each side for about 2 minutes each, then return to a plate or pizza peel and add the sauce and toppings. Slide back on to the grill and barbeque for about 5 - 7 minutes until the the pizza is done, then top with the fresh baby arugula. Whisk the yeast in the warm water with the sugar. Let it sit in a warm place, until the yeast mixture begins to foam up. Sift the flour and salt into a large bowl. Make a well in the middle, and drizzle over the olive oil. Pour in the yeast mixture, a little at a time, mixing it in with the flour, until all the mixture is used up and you have a soft dough. If the dough is too dry, add more water, a tablespoon at a time, until you get a soft, but not sticky dough. Dust your workspace with a little flour, and turn the dough out on it. Knead well for about 7 - 10 minutes, until the dough is smooth. Shape the dough into a ball, and place it in a well oiled large bowl. Cover with a damp towel and proof it for about 1 - 2 hours, until the dough has risen well and doubled in volume. Gently knock back the risen dough and turn it out on to a floured surface. Divide the dough into 4 pieces (or 2 pieces if making large pizzas). Using the palm of your hand (or a rolling pin) flatten the dough into a circle. The thickness of the pizza base depends on how you like your pizza. If you like it with a thin crust, roll out the dough until its quite thin. If you like a deeper crust, then make your pizza smaller and thicker. I like my pizza not too thick, so I flatten my dough to make a pizza around 7 - 8 inches in diameter. This is completely up to you. Make the remaining bases the same way. Place the pizza bases on a pizza peel or a pizza pan. Lightly spread some spicy tomato sauce (recipe below) on them, and then scatter on diced peppers, tandoori prawns (recipe below) and cubes of feta cheese. Bake in a 450 F oven for about 10 - 12 minutes, until the crust is crisp ( a little longer if you have a deep pizza crust). Scatter on the baby arugula leaves and cilantro (if using) and serve. Heat the olive oil in a heavy based pan, and add the onion. Sweat the onion for about 5 - 7 minutes, then add the garlic, oregano, chilli flakes and cayenne pepper (if using). Saute for a minute, until the garlic is fragrant, then add the crushed tomatoes. Stir well, and season with a little salt. Cover the pot, and simmer for about 15 minutes. Taste and adjust the seasoning to taste. Let cool before spreading on the pizza base. Whisk together the tandoori masala, plain yogurt and 2 teaspoons oil. Stir in the lemon juice. Season to taste with salt and pepper. Marinate the prawns in this mixture for about an hour, or longer. Transfer to a plate lined with kitchen towels, and drain for a few minutes. Use the prawns to top the pizza. These prawns also make great appetizers with a squeeze of lemon juice on top. If serving as appetizers, fry them for few more minutes, until they are cooked a little more. Disclosure: I received coupons to try out cheese from Arla Foods. All opinions are my own, and I was not obliged to review the products on this website. The recipe is my own creation, and I used and chose to write about the product because I liked it. I am very particular about what I review on the blog, and I hold complete editorial control over my posts. Love tandori pizza but I've never made it with tandori prawns. that would be awesome indeed. I actually use naan bread as my crust and make mini pizzas! It works really well with baby spinach as the greens too. Delicious. Please don't reduce the chilli flakes on my account, I really like a little spicy sauce on my pizza. The pizza looks so delicious and colorful. Can we add chicken rather than adding prawns for it because my kids don't like to eat prawns. I'm definately going to try this recipe. Yummy! looks delicious, pizzas are my all time favourite. When it’s come to prawns no second thought I’m going to try this out. What a fantastic recipe, I have to admit I am very much stuck in a rut when it comes to Pizza recipes, so I will most definitely be trying this! 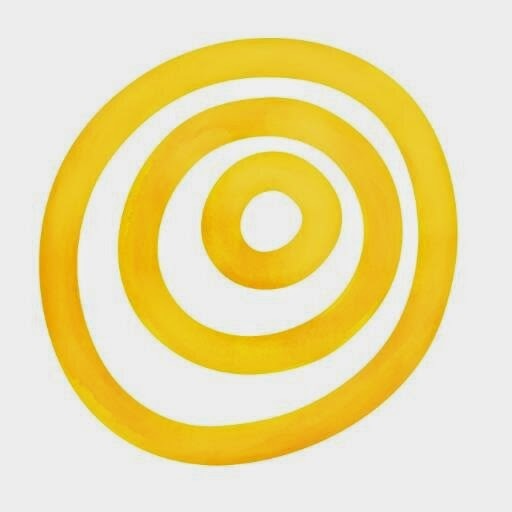 What are your opinions on perhaps baking a pizza on a BBQ?I have been told to try it on a pizza stone although I must admit I am very weary, any advice would be greatly appreciated. That pizza looks awesome! I may have to suggest that my sisters and I give it a try. Nice work and good luck.